Amazon has a bold new gadget, and it’s a button. 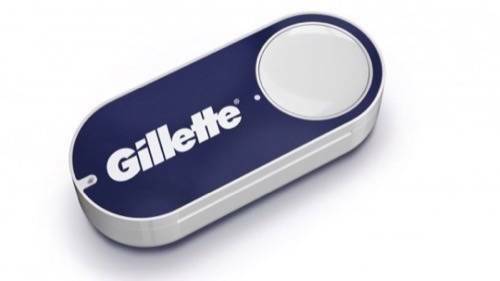 It’s literally a stick-on, Internet-connected button that, when pressed, sends a “Bat-Signal” to Amazon to order more dog food, coffee, detergent or other common household goods. The new Dash Button looks like an April Fool’s Day joke, but it actually reveals quite a lot about the company’s serious intentions to enter a new category: the smart home. The company makes plenty of consumer gadgets, but it hasn’t had a smart home initiative of its own. Now Amazon has been shopping around the back-end system behind its new button, the Dash Replenishment Service (DRS), and picking up partners across home categories. Whirlpool, Brother, Brita and Quirky are first on deck, and this fall, they will offer built-in DRS support in their upcoming releases. What consumers will see are products that know when it’s time to order more laundry soap or water filters and order them from Amazon on their own. The concept hints at a future in which consumers’ houses can manage themselves—not just through remote features in some nebulous cloud, but tangibly in the real world. Let’s get one thing straight: Amazon is not trying to infiltrate your home. It already lives there. The company offers TV gadgets, mobile devices and e-readers, not to mention browser bookmarks, third-party mobile apps and streaming TV apps, taking root in living rooms, computer rooms and reading rooms. What it wants now is every other room in your house. To get there, the company has been trying to drum up DRS support from partners, offering different ways to tie into the service. According to Amazon press rep Kinley Pearsall, device makers can work with DRS a couple of different ways: They can either apply the physical buttons to appliances (“Imagine, for example, a coffee maker with a button you push when running low”) or they can “integrate the service into the device, whereby the device automatically reorders items for you” when it senses you’ve run low on supplies. Amazon’s first four partners have chosen the latter. Whirlpool’s laundry machines will know when you’ve run out of soap; Brother printers will tell when you need more ink; Brita pitchers will make sure you’re not caught without new filters; and products from inventors’ site Quirky will offer products like coffee makers, formula makers and pet food dispensers that can measure your supply of consumables and order through DRS before you run out. Such units rely on sensors that can determine when levels are low. 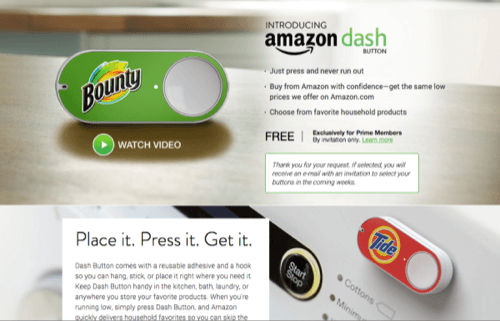 However, “dumb” products can still get in on the action, thanks to those (sort of charmingly) low-tech Dash Buttons. For consumers, the idea seems very approachable, particularly for people who aren’t yet convinced about buying and installing connected devices all over their houses. 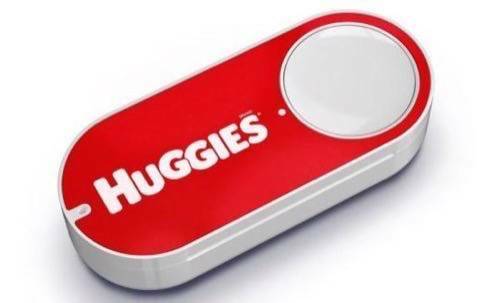 But Amazon’s not out to blanket the world in buttons. The Dash hardware is available by invitation only, and only Amazon Prime members can request invitations. The products, too, are only available from a select group—so far, Bounty, Tide, Clorox wipes, WellPet pet food, Gillette, Olay, Glad, Huggies, Gerber Formula, Cottonelle, Kraft Mac & Cheese, Maxwell House coffee, Gatorade, Izze, Lärabar, Smartwater and L’Oréal Paris. The company may or may not make them more broadly available, but the real goal behind Dash Buttons may be to introduce the concept and show off how the system can work. “There’s a single button per product, and you can customize what it orders within the brand,” said Pearsall. “For example, with the Tide button you can pick the size and scent of the Tide you’re ordering.” Simple. The Internet of Things market will be valued at $7.1 trillion in the next five years, says research firm IDC.  That’s plenty of incentive for companies to flock to this space. Plenty have, and the e-commerce giant has had a front-row seat to see how they’ve fared. So many smart-home products come and go on its site, in fact, that Amazon has even dedicated a special section to home automation. Now, it’s finally ready to get in the game. Of course, it’s doing that as only Amazon could. The company—which popularized voice search for streaming TV devices with Fire TV; put an e-commerce-first experience on its tablets and e-readers; integrated live customer support in its mobile gadgets; and basically mashed up Siri, Google Now and Sonos in its Echo smart speaker—is taking a different approach than most of its competitors. Most smart home purveyors push out numerous ways for people to control their locks, lights and cameras. While decent safeguards, they often wind up as occasional novelty features. Amazon seems intent on doubling down on pragmatism. We may only rarely need to turn our lights on and off from across town, but we will regularly run out of toilet paper, trash bags and French roast. Not that others haven’t tried to offer similar features. Companies like Samsung, LG and GE have been touting connected appliances for years, putting out refrigerators, ovens and laundry machines that know that you’ve run out of key supplies or when service is required. They haven’t quite caught on, though, mostly because of complexity and high retail prices. 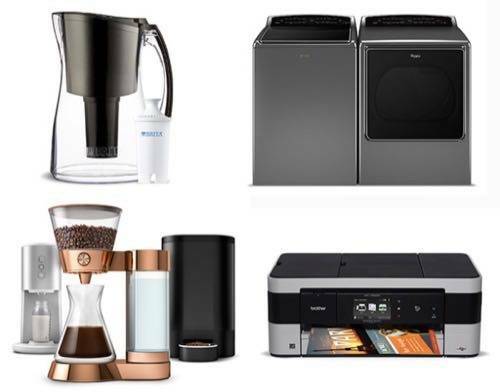 Amazon offers a quick and easy system for a variety of device makers, from small kitchen electrics to larger appliances. Those third-party devices allow Amazon to do what few smart homes can: provide solutions for real-world problems with a system that adapts to people’s needs, without complicated processes or tricky settings. Also impossible to ignore are the company’s other offerings, like the new Amazon Home Services for live home repair or support, or its slew of devices, some of which could eventually act as command centers tying together its services. When it comes to fusing physical and digital services, few have the penchant or infrastructure that Amazon boasts. The company seems to have some of the triggers in place to make a go with a new type of smart home system. Perhaps all it has to do is push the button.